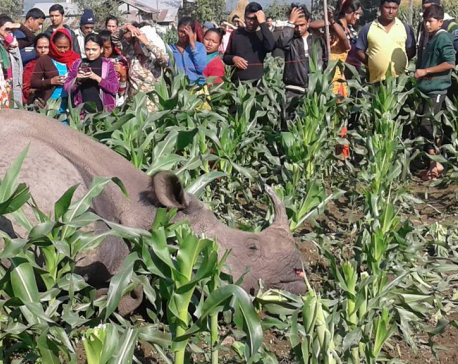 CHITWAN, April 8: Poachers have killed one rhino after a hiatus of long time at Chitwan National Park. One rhino was found dead with its horns taken away at Jagatpur Belhaththa Hariyali Madhyawarti Community Forestry, informed Narendra Aryal, assistant Preservation officer and information officer at Chitwan National Park. The last time a rhino was killed at Chitwan National Park was on May 3 ,2014. The rhino was shot dead as indicated by the wound in its head, said San Bahadur Tamang, chairman of Kerunga Madhyawarti Users Committee of Jagatpur. The rhino has been killed by poachers at time when preparations are afoot for celebrating three year complete control of poaching. At this time, rhinos are also being moved to a different habitat. The rhino was killed at a place that is 3 km away from Kasara where the main office of the national park is located. In the same place, poachers had killed a rhino on May 3, 2014.